Wal-Mart seems to be having a nationwide, non-coordinated, unannounced sale on premium target loads. I’ve been hearing about this from shooters across the country. Last night my friend Rick called. “I’m at the Wal-Mart in Washington [Iowa]. They’ve got Winchester AA target loads for $5 a box. I bought all the 20 gauges. Do you want the 12s?” They usually sell for $7.50 a box. I told Rick I’d take whatever he could carry to his car. Turns out there were only nine boxes left, but they’re mine. Wal-Mart made news last year eliminating firearms from several hundred stores. I may be wrong, but I don’t think they’re getting out of the ammo business entirely. You’ll probably still be able to buy cheap dove loads. Most Wal-Mart shoppers (and that includes me) aren’t going to pay $7.50 for premium target loads. Whether they’re going out of the shotshell business or not, $5 AAs and STSs are hard to come by these days. You might want to check the sporting goods shelf at Wally World and let us know what you found. Last week some of the New York staff were taken out to Colorado by the National Shooting Sports Foundation who put them up in a glorified Holiday Inn where they spent a couple of days listening to presentations about the problems facing hunting in the 21st century. I didn’t go, as it is my policy not to attend industry events that don’t involve me shooting stuff. Also, I wasn’t invited. Those who went came back with a newsflash: access to land is the number one issue facing hunters today. No kidding. It took two days in a hotel to figure that out? I live in a place where free access to private land remains relatively common, although that’s changing fast. There’s a big public area about twenty minutes from town. It gets hunted hard, but it’s close. In short, it’s possible if you are a high schooler or poor college student – or poor adult for that matter - to find a place to hunt nearby. But that’s true in fewer and fewer places. It doesn’t bode well for the future of hunting if we get the next generation all excited about the sport then give them nowhere to go. Exit question: how hard is it for the young, impecunious and unconnected to find a place to hunt where you live? One of the people I miss most is Field & Stream's former Executive Editor, Peter Barrett. He was the real deal: a master fly fisherman, expert shot, gun nut, hunter of wide experience, and fine writer. He was a true New England yankee, a man who loved his pipe, and a fellow of few words. "LIEUTENANT, JUST WHAT THE HELL DO YOU THINK YOU'RE DOING?" Peter did a proper about-face, still peeing, and said, as he hosed down the general, "Going to the bathroom, sir." He escaped court martial only because the Air Corps was desperate for pilots at the time. When Peter was Executive Editor, I was Managing Editor and, being in my thirties, thought of myself as the full flower of manhood. But Peter called me "kid." One day I said, "Peter, I ain't no kid." So he said, "Kid, read this," and pointed to a framed letter hanging above his typewriter. It was his first "buy" letter from Field & Stream, and it was dated eight months before I was born. That was the end of the "kid" problem. Back in the early '80s, network television used to run ads for ginsu knives, Popeil's Pocket Fisherman, Boxcar Willie record albums, and stuff like that. These things ran at 3 in the morning, and the rates were dirt cheap, so whatever genius was in charge of Field & Stream's circulation decided we would film some promotional ads to get people to subscribe. Peter Barrett was tapped for the part of Uncle Ned, who was showing his "grandson" how to flyfish, and to play the part of the grandson, the ad agency picked some bratty kid actor who hated water, fishing, and Peter, although not in that order. "If you do that again, you little ****, I'll drown you." The kid, sensing that he was in the presence of death, screamed, ran ashore, and that was the end of the commercial. Last time, I talked about lack of access as the number one problem facing hunting today. True enough, but I would like to nominate another candidate, and, no, it’s not video games. Youth sports are killing hunting. I don’t mean normal youth sports, like Little League (which I didn’t do. I had a very specific, irrational fear of being killed by a line drive to the temple) or playing on school teams (which I did enthusiastically). I blame the year-round, traveling team club sports for sucking up family’s leisure time and squeezing out hunting. Since when did watching a kid play a game become more important than actually doing something with him or her? We hunters are an easy target for the popular media, and probably the last group not protected by P-C sensitivity. This link carries you to Monday’s installment of Non Sequitur, a predictably knee-jerk and rarely funny comic strip by Wiley Miller that appears in 700 papers nationwide. This story line has run for the last five days or so. To get you up to speed, Lucy and Petey are a pony and a dog. Lucy, the pony, has fallen in love with a French Canadian moose. It’s moose season, and all three are in the woods, endangered by hunters or, as we’re called here “terrorists.” That’s right, Wiley uses the “T” word on us. It would be insulting if it weren’t so sadly stupid. I can guess how you all feel about this, but if you want to vent anyway, knock yourselves out. Prudent gun nuts, upon visiting Safari Outfitters in Salt Point, NY, are advised to bring a change of underwear along, because the odds are that you will wet yourself (or worse) at some of the guns you will see there. The most recent shorts-stainer is a one-of-a-kind matched pair of Purdey 28-gauge hammer guns, complete with three sets of barrels. 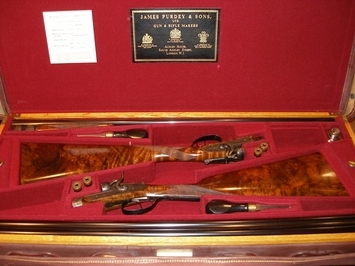 The original guns were built by Purdey in 1878, and recently went back there for a complete re-do. The original engraved lockplates, hammers, triggers, and trigger guards were retained, but everything else is new: locks, stocks, and barrels. (The stocks, incidentally, are what is called “bookmatched;” i.e., the blanks are sawed from the same log, so both stocks are nearly identical.) Even the case is new, and of course it comes with a set of handmade tools. And the winner is: Jed. It is short, sturdy, easy to yell. It goes well with Ike. I have never known anyone named Jed, so the name is a clean slate for this little dog to work with. And, it gives me an excuse to sing the “Beverly Hillbillies” theme song to the puppy. Thanks to Scrap 5000, who sent in a very long list of names and trusted one of them to hit the mark. Accuracy is fine for rifle shooters, but we shotgunners know putting lots of pellets in the air is the key to hitting a target. Levi finished a very close second. Thanks to Fred for the name. My friend Cody McCullough owned a Levi, one of the best of the many good shorthairs I’ve hunted over. I was tempted to name this dog after that Levi but decided ultimately he needed a name of his own. Because of the huge number of entries this contest generated, and because Levi and Jed essentially tied, I will look in my box of knives for a second prize to award to Fred. To those of you who suggested “Petzal” as a name, Dave is a cat person, and I have made note of your entries. Should there ever be a “name Phil’s cat” contest, you win. Hank, after the hero of John Erickson’s “Hank the Cowdog” series. I read a bunch of those books to my younger son as bedtime stories when he was in the second grade. My older son used to listen in even though he was too old for them, and all three of us laughed a lot. It’s a good series to read to young kids. Another good bird dog name from those books is “Plato,” who is the snooty pointer that appears as a minor character. “Baldur” I like the names from Norse mythology (my wife does too, and lobbied hard for “Loki”). But, given the state of my hairline, I’d have gotten really tired of the “Bald and Baldur” jokes. “Sam.” My first shorthair was a “Sam,” a gift dog I should have looked in the mouth. He was a very badly socialized dog who never liked anyone but me. He had such serious “steady to wing” issues he chased a low-flying Cessna for three-quarters of a mile. Equal measures of love and electricity over several years eventually made Sam into a wide-ranging, outstanding pheasant dog. For three seasons he was almost unfair to hunt with, then his health failed. Again, to all of you, thanks. Scrap, you’re the man. Fred, you’re number two. E-mail your addresses to [email protected] and I’ll get your prizes out to you.